California’s high-speed rail line from LA to San Francisco is estimated to cost nearly $100 billion. New York City’s Second Avenue subway will cost $5 billion just for the first two miles. And New York’s Water Tunnel No. 3 will not only cost more than $6 billion, but take nearly half a century to complete. What’s going on here? Why do big civil engineering projects in the United States cost so damn much? I’ve often wondered about this, so I was interested in Stephen Smith’s Bloomberg column today on just this subject. Other advanced countries, he says, build big projects for a lot less than we do. What’s their secret? the practices he used to design the system’s latest expansion. The don’t-do list, unfortunately, reads like a winning U.S. transit-construction bingo card. …Melis  warned against “consultants who consultant with consultants and advisers who advise advisers,” something American planners would do well to learn. He said he didn’t hire any “large firm of consulting engineers” as general project managers for his Metro de Madrid expansions, and that designers weren’t allowed to interfere with, or bid for, their own construction contracts. Not so in the U.S. Parsons Brinckerhoff, perhaps the biggest name in the nation’s transit construction industry, is both the lead-design contractor and project manager for California’s planned high-speed rail line, and the company stands a good chance of winning construction contracts for its own designs. Okay. Better control of projects, no architectural flights of fancy, and a clean division between the designers and the builders. What else? Larry Littlefield, who has worked in logistics and as a budget analyst at New York City Transit, also suggests the U.S. legal system is an obstacle to designing and building affordable infrastructure…New York government agencies are saddled by procurement rules dating back generations, Littlefield says, when corruption in infrastructure projects was endemic. Reformers demanded objective and easily policeable standards, which often meant lowest-price bidding rules. Bidders compete mostly on price, not quality. 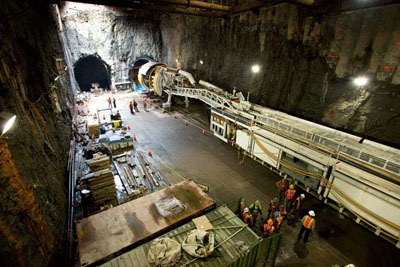 The MTA must continue to award contracts to the lowest- price bidder, and without the ability to hold bad contractors accountable, Littlefield said, the agency turns to “writing longer and longer and longer contracts, expressly prohibiting every way it has been ripped off in the past.” The byzantine contracts that come out of this process drive entrants away, limiting competition and pushing up costs. I’ll confess that this doesn’t seem like quite enough. But maybe it is. Maybe small government obsession, kowtowing to private contractors, and excessive environmental and legal obstacles really are the big problems for American transportation projects. In any case, this is interesting stuff. At least it’s a start toward understanding the problems we face getting big projects built.